September 11, 2016, 9:26 a.m. The latest wave of the YouGov/CBS News 2016 Battleground Tracker shows a considerably closer race in Florida compared to last month, while Democrat Hillary Clinton has held onto a more comfortable lead over Donald Trump, the Republican, in Ohio. 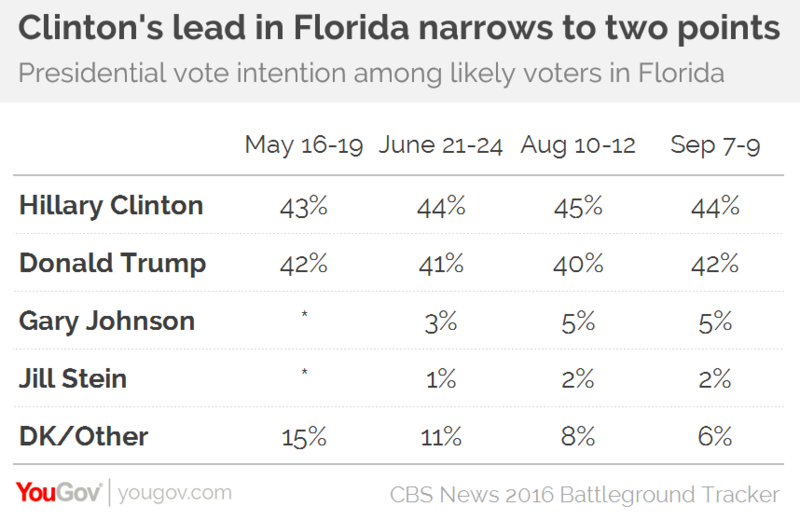 In Florida, gap between Hillary Clinton and Donald Trump has narrowed to two points, with Clinton marginally ahead of Trump with 44% to the Republican’s 42%. Early in August, Clinton led by five points in the ever-important swing state. Over the same period national and other state surveys have shown Clinton’s support falling back from its post-convention highs. 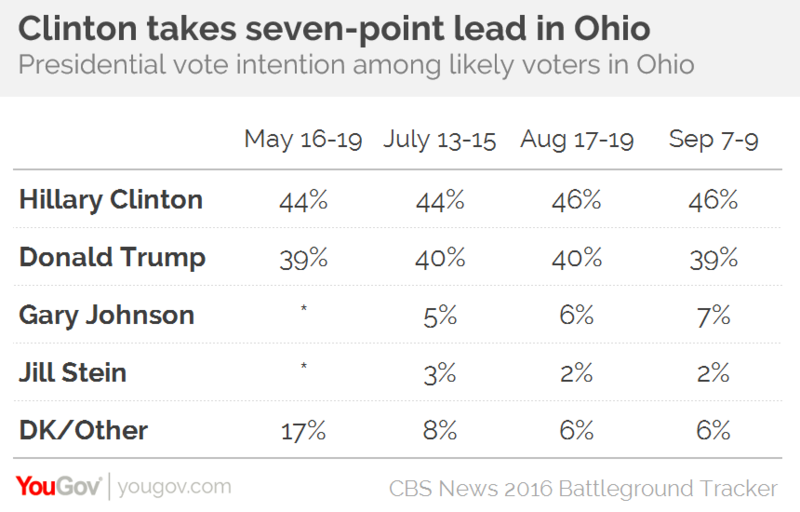 The latest Battleground Tracker poll in Ohio bucks this trend. There Clinton leads Trump by seven points, 46% to 39%, her best showing in the state yet. On the eve of the Republican National Convention, she led by only four points. By August, however, her lead had already grown to six. In both states Clinton maintains wide margins among non-whites and young people, while Trump leads comfortably with whites and older voters. Clinton’s advantage is also rooted in more unified support among self-identified Democrats than Trump boasts from Republicans. Similar trends hold across 13 competitive states polled as a group. In these states, Clinton holds only a negligible one-point lead over Trump, 43% to 42%, but wins 87% of Democrats compared to Trump’s 82% among Republicans. Trump closes much of this gap with an 8-point lead among independents. When the same group of states was polled last week, Clinton earned 42%, while Trump was two points below where he is now, at 40%. The thirteen states included in the poll are Arizona, Colorado, Florida, Georgia, Iowa, Michigan, North Carolina, New Hampshire, Nevada, Ohio, Pennsylvania, Virginia and Wisconsin. While Barack Obama won 10 of these 13 states in 2012, as a matter of popular vote Mitt Romney actually performed slightly better in these states than he did overall. Nationally, Romney trailed Obama by four points, 47% to 51%, but in these 13 states the deficit was only two points, 48% for Romney and 50% for Obama – barely distinguishable from the one-point difference that now separates Trump and Clinton in the same states. As the nation marks fifteen years since the 9/11 terrorist attacks, neither the prospect of a Clinton presidency nor a Trump presidency makes the majority voters in competitive states feel “safe”. To be more precise, in the 13-state survey only 41% think Trump would make them feel safe if he was elected president, while only 42% say so for Clinton. But when it comes to a range of other measures relating to each candidate’s readiness to deal with foreign policy challenges, the former Secretary of State tends to score better. 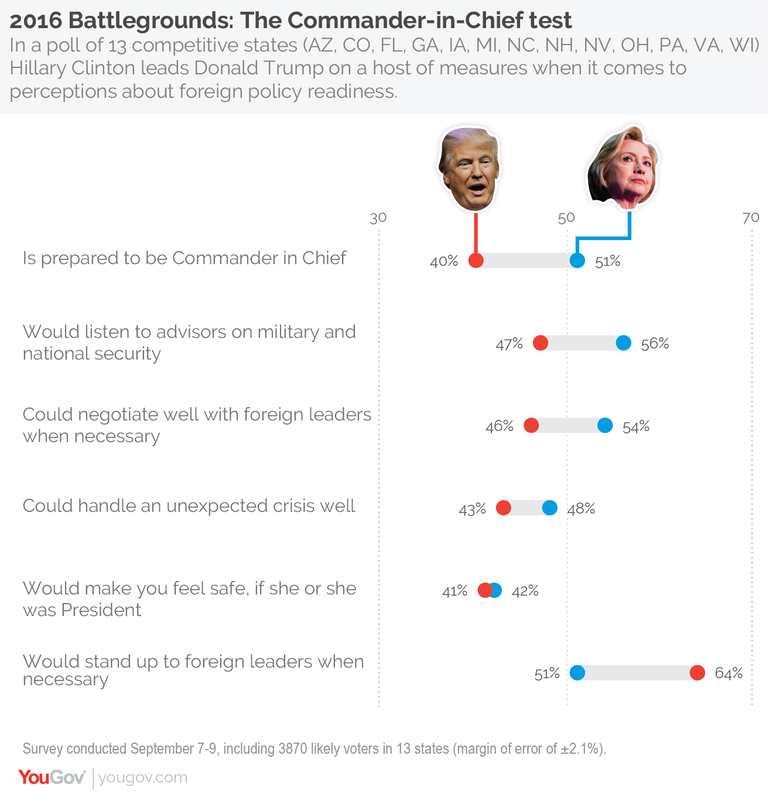 Indeed only 40% say Trump is prepared to take on the role of Commander-in-Chief, compared to 51% for Clinton. Voters in these states are also more likely to say Clinton could handle an unexpected crisis (by a margin of five points) and even that she could negotiate well with foreign leaders (by a margin of eight points). The one attribute where Trump stands out is his willingness to stand up to foreign leaders – 64% say Trump would do this, compared to 51% for Clinton. What may work more in the Republican’s favor is the fact that 53% of Americans disapprove of how President Barack Obama’s approach to fighting ISIS – a battle only 15% say America is winning, and 29% say the country is losing (43% call it a stalemate). 57% believe Islam encourages violence more violence than other religions around the world, and 47% would support a temporary ban on Muslim immigration into the US. Interviews were conducted September 7-9, 2016 for the CBS News 2016 Battleground Tracker. 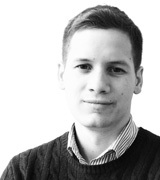 A detailed description of the methodology used to carry out the surveys can be found here. See additional questions and demographic breakdowns for Ohio, Florida, and the 13-state Battleground survey.